The vendor landscape of the global market for surge protection devices has been rendered largely fragmented and competitive owing to the presence of a large number of product manufacturers, notes Transparency Market Research in a recent report. The market has witnessed increased efforts from leading vendors towards the introduction of innovative and more advanced product varieties and expansion across emerging regional markets and application areas. Moreover, funds diverted towards R&D efforts have also seen a significant surge in the recent years. Some of the leading companies in the market are Emerson Electric Co., Schneider Electric S.E., Raycap Corporation S.A., Eaton Corp. PLC., GE Industrial Solutions, Tripp-Lite, and ERICO International Corporation. According to the report, the global surge protection devices market is likely to exhibit a promising CAGR of 5.6% from 2014 to 2020, rising to a revenue opportunity of US$2,808.6 mn by 2020. Of the key applications of surge protection devices covered in the report, applications across the industrial segment accounted for a dominant share in the overall market in 2014, valuing at US$763.2 mn in the same year. This can be attributed to the steady pace of industrialization in regions such as Asia Pacific and Middle East and Africa where the uptake of automation technologies in manufacturing and processing sectors is high. Geographically, the market in North America held the dominant share in the overall market, thanks to the rising sales of electrical and electronic devices in the industrial and residential sectors in the region. The region is likely to retain its dominance over the forecast period in terms of revenue contribution to the global market, despite it being predicted to register the lowest CAGR over the forecast period among all the regional markets examined in the report. One of the key factors driving the global surge protection devices market is the massive rise in the use of electronics devices in the residential and enterprise sectors globally. Electronic appliances such as refrigerators, personal computers, air conditioners, televisions, microwaves, printers, alarms, and a variety of complex smart computing devices has necessitated the presence of surge protection devices to protect equipment from excess flow of power. The rising prevalence of transient voltage and lighting incidents across the globe is also working in favor of the global surge protection devices market. Macroeconomic factors such as the rising disposable incomes of people, improving power distribution infrastructure, and easy availability of advanced and innovative electronics devices, especially across emerging economies, are also contributing to the steady expansion prospects of the global surge protection devices market. 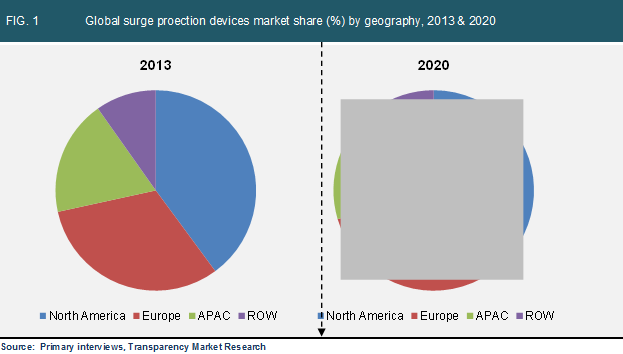 The thriving consumer electronics industry in regions such as Asia Pacific is also expected to have a positive influence on the global surge protection devices market.